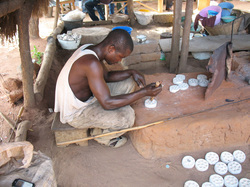 The Krobo bead makers are best known for their wonderfully colorful powdered glass beads. 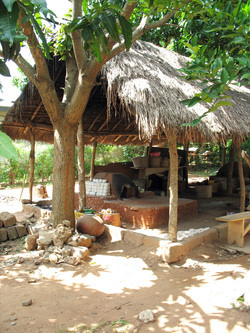 Made from recycled glass, the beads are still produced in open-sided, thatch-roofed huts, using traditional, labor-intensive methods. Using a large mortar and pestle, the bead maker first pounds the sheets and shards of glass into a fine powder. After sifting the powder to remove any chunks, he (or, less often, she) adds small amounts of ceramic powder or "mason stain" to intensify the base color of the beads. The powder is then carefully poured into (usually) cylinder-shaped holes that have been carved into homemade clay molds. A stick from the casava plant is inserted into the center to form a bead hole. 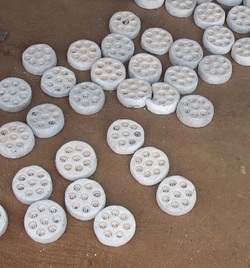 Meanwhile, the bead maker has been firing up the clay oven, also homemade. He feeds it using brush and small logs which, if he lives in a town, must be obtained at great expense from outlying areas and hauled home in a rented truck. Now, using a long-handled spatula-like tool, he inserts the molds into the fiery oven. As the beads fire, the casava sticks burn out, leaving holes in the centers of the beads. Once the beads have reached a putty consistency, the bead maker removes them from the oven and uses a tool much like an ice pick to loosen them in their molds. If they are done, he takes them out one at a time and presses down on one side to give the bead the slight curve that allows it to nestle comfortably up against its counterparts when strung into a circlet for market. After the beads have been cooled and washed, the bead maker begins the painstaking process of painting his highly individualized designs on the beads. After each color is applied, the bead must be re-fired. The beads often have as many as five or six different colors on them. The beads are then strung on cotton string into double circlets a little bit larger than an average-sized bracelet. They are tied off with triple knots and sent to market to find their way into the world. Soul of Somanya buys its Krobo beads at full retail prices to offer for resale in the global marketplace. In addition to boosting local bead sales, this helps us to pay our jewelry artisans a consistent living wage while simultaneously increasing the visibility of, and demand for, these beautiful little works of art throughout the world. To date, we have shipped Krobo beads to well over two dozen countries worldwide.